JOHN COBB and his 1933 Napier-Railton (www.wp.me/p2ETap-1lR) were certainly the pair for setting record after record on Brooklands’ 2 1/4-mile circuit in England. Cobb piloted his Napier-Railton on the River Wey bump of the Brooklands banking with more than a dollop of courage. He was touching 130 mph there. Image from the Brooklands Museum (see www.brooklandsmuseum.com, www.wp.me/p2ETap-sk). 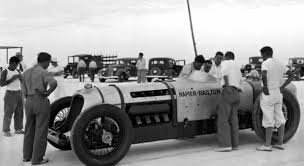 Between 1933 and 1937, Cobb’s Napier-Railton set world speed records at Brooklands, Montlhéry and Bonneville. Several of these were to stand for all time: a Brooklands fastest lap of 143.44 mph—driven in damp conditions!—and a fastest timed kilometer there of 151.97 mph. In 1934, circling the Montlhéry track outside Paris, the Napier-Railton set a passle of endurance records, including 12 hours at an average 121.19 mph. 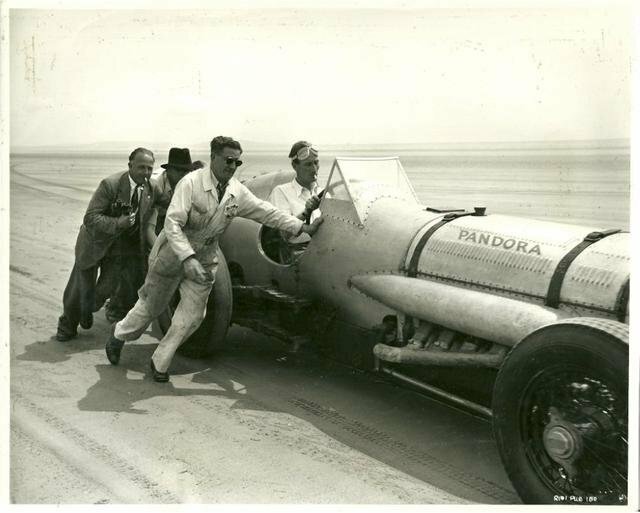 In 1935 and 1936, Cobb, the car and his crew visited the Salt Flats of Bonneville, Utah. Again, records fell, including an average 150.16 mph for 24 hours. The Napier-Railton’s fuel filler gave access to a 65-gal. tank. What with the car’s estimated 5 mpg Imperial, the filler got frequent usage during endurance runs. A dry-sump oil system held 15 gal. ; the coolant system, 12 gal. The Bonneville crew: John Cobb is on the car’s left near its name; designer Reid Railton is across from him (in front of the photo-bombing pole). The Napier-Railton ran sans its Brooklands silencers at Bonneville, the drivers’ eyes at night shielded from its stubby exhausts’ glare by added bodywork. The car spent World War II in storage, but made up for it with post-war excitement. The Napier-Railton had a Hollywood role with Ava Gardner (missing in this publicity photo). She and the car shared a name in this 1949 movie. The film Pandora and the Flying Dutchman recasts Wagner’s Der Fliegende Holländer, with James Mason playing the cursed sea captain and Ava Gardner, as Pandora, redeeming him through love. Another of Pandora’s lovers is a land-speed record-holder who drives—ta-da!—the slightly restyled Napier-Railton. Most of the filming was on Spain’s Costa Brava, but the land-speed sequences were shot along the 7-mile Pendine Sands, a Welsh counterpart of Daytona Beach. It’s quite a good movie (see http://goo.gl/asdQ8u), and all the more fun for its starring role of the Napier-Railton. Testing parachutes used in high-speed aircraft landing, Dunsfold Airfield, 45 miles southwest of London, 1951. Image from www.telegraph.co.uk. 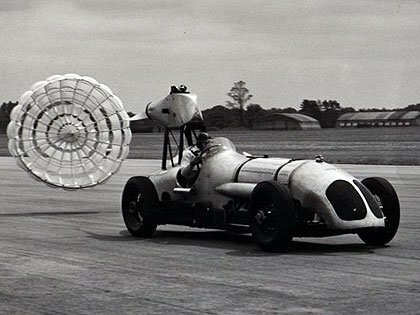 In 1951, the Napier-Railton was sold to the GQ Parachute Company, involved at the time in developing chutes for aircraft braking in high-speed landings. The car was fitted with hardware allowing deployment of the parachute at speed and its retraction once the car reached 30 mph. It was at this time that the Napier-Railton’s rear drums were upgraded to Dunlop disc brakes (the car never has had front brakes). Subsequently, the Napier-Railton took part in England’s vintage racing scene and then retired to various custodians. The Brooklands Museum acquired it as a pride of its collection in December 1997. 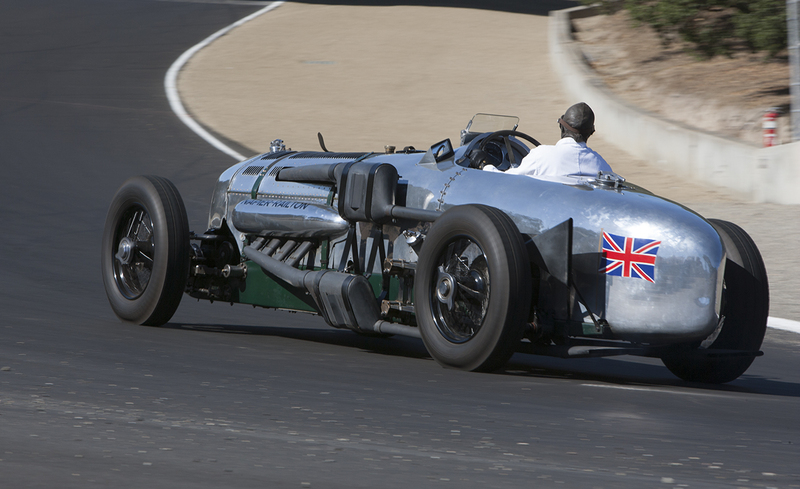 Allan Winn, the Brooklands Museum director, exercises the Napier-Railton at Laguna Seca Raceway, 2007. 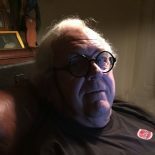 Image by John Lamm. 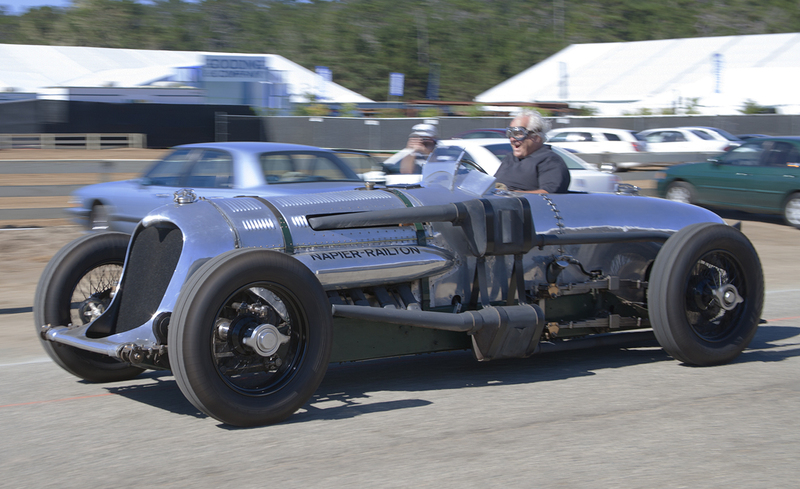 The Brooklands Museum brought the Napier-Railton to the 2007 Monterey Weekend, where it was a star display at the Pebble Beach Concours d’Elegance and also lapped Laguna Seca. 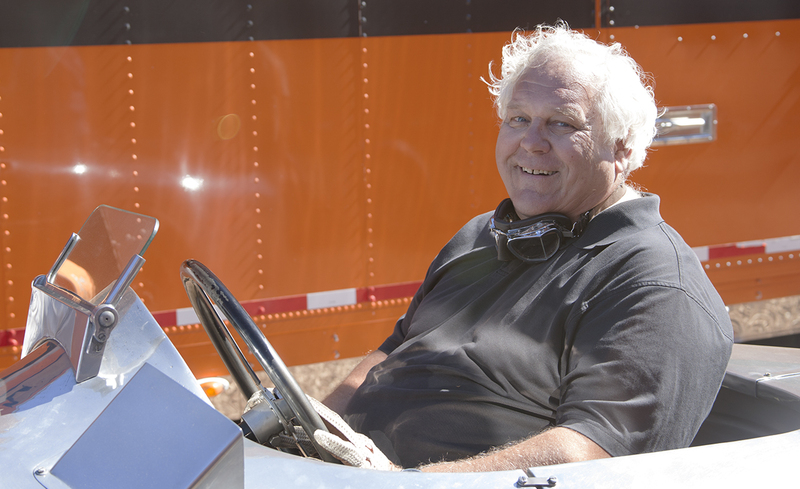 Your author at the wheel of the Napier-Railton at the Polo Field, Pebble Beach, 2007. Image by John Lamm. Through the kindness of Allan Winn, director of the Brooklands Museum, Geoff Dovey, his Napier-Railton specialist and Kandace Hawkinson of Pebble Beach Concours—bless all three—I had a brief drive of the car along the Polo Field roads (part of the original Pebble Beach road circuit). 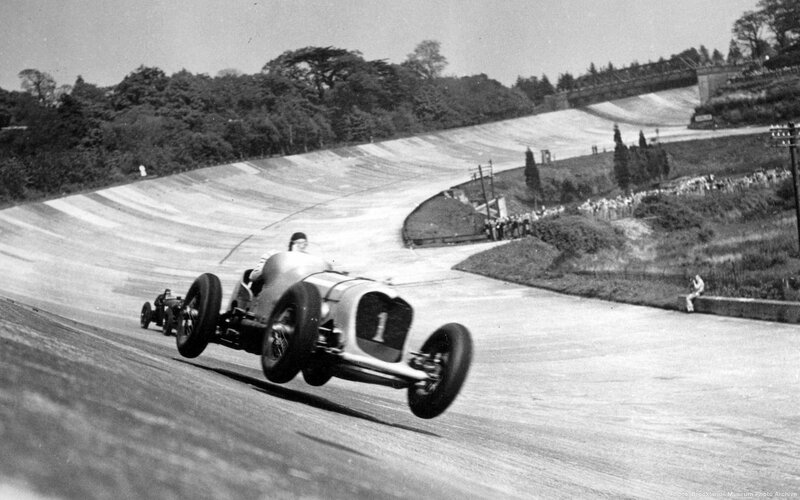 I suspect this photo coincides with my depressing the pedal in the middle—the Napier-Railton’s accelerator. Image by John Lamm. Driven with appropriate respect, the Napier-Railton is remarkably docile. Then I tickle the middle pedal—and all the 24 liters of torque is applied. “Of course I drive a car. What made you think I didn’t drive a car?” Image by Stan Mott, Road & Track, January 1993. Dennis, nice work. Thanks for this captivating “two-parter”, and for the chance to apply a favorite word . . . juggernaut. What a thrill it must have been to drive. This juggernaut must rank near the top on any displacement to weight ranking. 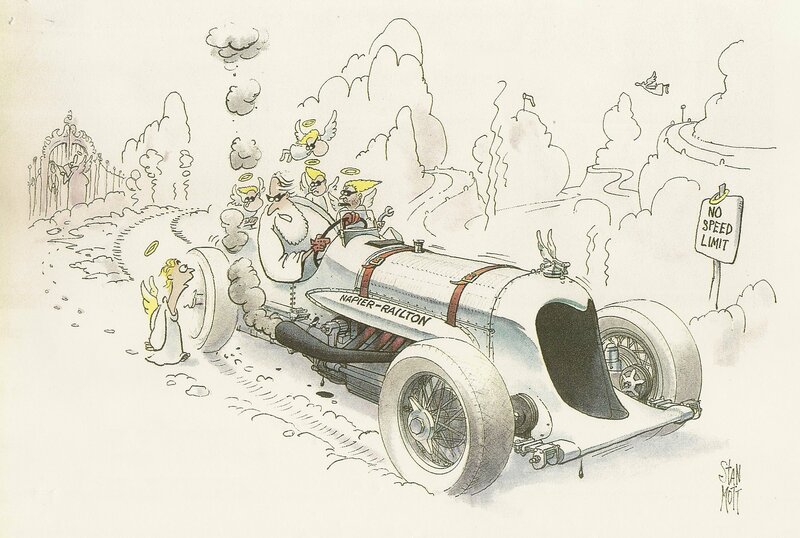 This entry was posted on July 30, 2013 by simanaitissays in Classic Bits and tagged Brooklands Museum, DS drives Napier-Railton, John Cobb, Napier Railton Part 2, Stan Mott cartoon.